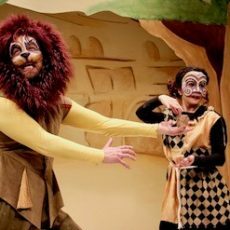 One of the most popular children’s plays ever written, Aesop’s fable, Androcles and the Lion, has been produced in 20 countries. 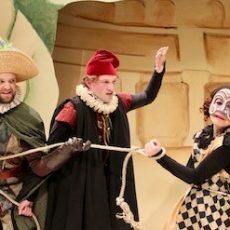 Refreshingly antic, this irreverent version is written in the style of Italian commedia dell’arte. 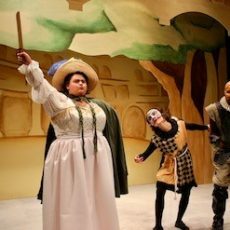 In commedia tradition, a group of strolling players set up their stage and give a performance. 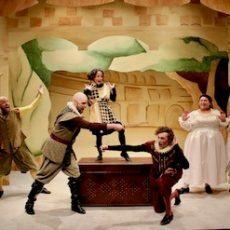 Using authentic staging and stock characters of commedia – the miserly Pantalone, the bragging Captain, the romantic lovers, the trickster Arlequin, plus an endearing lion – this fable becomes a colorful theatrical experience. 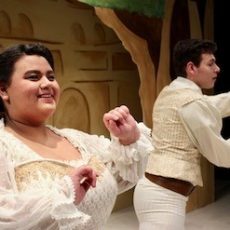 The play skyrockets with zany comedy. It also glows with the warmth of friendship. Androcles and the Lion is a prize-winning play, applauded around the world again and again! Students can purchase rush tickets 1 hour before the performance at the FAC front desk for $15 (Colorado College students receive a FREE rush ticket). Tickets subject to availability; Must purchase in person; CC students must present a CC Gold Card. 11 a.m. to 12:45 p.m. Delight your young emerging artist in a magical experience they won’t soon forget. Our Day Camps offer kids 6-13 a fun, educational experience complete with a tour of the theatre, hands-on activities, a personal meet-and-greet with the cast members, and more! Cost is $20 per child. Performance tickets to Androcles and the Lion are additional.